This climb can be divided into two parts. The first runs from Forni Avoltri to Cima Sappada (402 meters in altitude) over the wide and quite busy SR355. Five kilometers after the start this part contains a fairly steep section, a kilometer with a slope of 11-12% with a 250 meter strip of 14%. 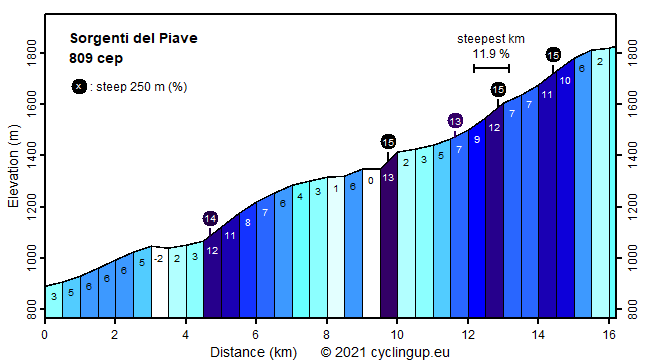 The second part of the ride (573 meters in altitude) is very rewarding. It runs from Cima Sappada through the Val di Sèsis to the Rifugio Sorgenti del Piave. The Val di Sèsis is a superbly beautiful valley, especially the last part with the Monte Peralba (2694 m) as the highlight. It is noteworthy that in 1988 this mountain was climbed by Pope John Paul II. The road is narrow, often so tight that cars from the opposite direction cannot just pass each other. Fortunately, only a few cars drive here. The profile varies enormously with extremely steep sections and in between very easy sections. Three times there is a 250 meter long section with a slope of 15% and there is another one with a slope of 13%. Twice these strips lie in sections with a series of closely spaced and very sharp hairpin bends. Not easy for cars but nice to ride a bike, provided you have the right gear.